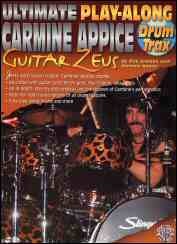 Tiger Bill Reviews Review of Ultimate Play-Along Drum Trax: Carmine Appice from Alfred Publshing. Carmine Appice, whose regularly updated book Realistic Rock has influenced multiple generations of rock drummers, has put together a book and CD based on seven of his favorite songs from a prior project known as Guitar Zeus. The Guitar Zeus band on the included CD is made up of Carmine on drums, Kelly Keeling on vocals and rhythm guitar (Shenker Group, Dokken, King Kobra), and bassist Tony Franklin (Blue Murder, Jimmy Page/The Firm, Whitesnake) on fretless bass. All songs were composed by Carmine and Kelly. Each selection features a guitar solo by a different rock guitar great. The drum parts were transcribed by Rick Gratton. Let's check it out. The book includes two drum charts for each song, one with Carmine's interpretation and a plain vanilla chart so you can follow along with the accompanying audio CD. The standard chart not only gives you practice in reading actual drum charts but allows you to exercise your own creativity while playing along to the songs on the audio CD, each of which are included both with and without drums. Preceding each drum chart is a break down and analysis of Carmine's performance by the master rocker himself. Here's a synopsis of each of the seven Guitar Zeus songs. Guitar solo by Ted Nugent. This tune is a straight ahead rocker in 4/4 time. Guitar solo by Paul Gilbert (Mr. Big). This one starts off with an intro in 5/4 time, then goes to 4/4 for most of the remainder except for an occasional couple of bars in 5/4 and one in 6/4. Guitar solo by Steve Salas (Rod Stewart Band). This one opens in 4/4 time featuring a bass drum groove and incorporates 5/4, 3/8, 6/8, and 7/8 time signature changes throughout. Guitar solo by Yngwie Malmsteen with special guest lead vocalist Doug Pinnick (King's X). This tune, entirely in 4/4 time, moves between a rock-funk feel to a swing feel (Carmine attributes this section to his Gene Krupa influence) and back to the original rock-funk feel again. Guitar solo by Richie Sambora (Bon Jovi). This one opens with Carmine playing a swing-like groove with brushes and then, using sticks, he gets into a funk-rock groove in 4/4 and 5/4 time, taking it out with a syncopated groove in 3/4. Guitar solo by Neal Schon (Journey). Carmine moves back and forth between 4/4 and 3/4 time in this one with a section that creates the illusion of slowing down the tempo through the use of various time signatures and added rests, while actually remaining in perfect time. Guitar solo by Zakk Wylde (Ozzy). The final composition uses 7/8 and 4/4 time signatures with a bar of 2/4 thrown in once in a while, just for fun. This book and CD combination, another in the continuing Play-Along Drum Trax series from Alfred Publishing, is of value to drummers of various experience levels who are looking to improve their rock reading skills and creativity. Beginners will benefit from practicing the real life Play-Along charts, while more advanced players will have fun playing Carmine's own version of the tunes, courtesy of the transcription talents of Rick Gratton who is himself a talented drummer.